The term Kufi comes with various connotations and at best it could be described as a seamless cap worn by Muslim men specifically for the purpose of offering salah. It’s invariably also known as ‘Muslim Cap’ ‘skull caps’ or ‘Muslim Topi. It is very much prevalent in the south Asian Muslim culture and could be seen sported by Indian, Pakistani and Bangladeshi men. Additionally, they are also markers of religiosity and could be seen sported on various significant Islamic events, ceremonies, weddings etc. Interestingly, not many know that Kufi caps or simply kufis come mandated under the sharia law of Islamic code of modest dressing. It is obligatory for both the genders to cover their hair (head) while offering salah and hence one could see hordes and hordes of colorful caps in prostration during a congregational service of Friday prayer.The most common amongst them in Asian markets is a plain white with design perforations or with some Croatia art-work in cotton or cotton-blend. The knit also varies from region to different cultures with each Muslim country throwing a spin on its make. The famous amongst them is a Tubeteika more colloquially known as the roositopi (Russian cap) which is commercialized with the usage of faux fur. It has its humble origins in the native Tartar culture. The Tarboosh hat or Fez hat is another Muslim cap, reminiscent of the Ottoman Empire very well found still sported in the Moroccan landscape. It’s a short cylindrical hat with tassels on top. It’s generally made of red felt and is also iconized on celluloid by many Bollywood Heroes of yesteryears. It’s also interesting to note that the etymological beginnings of topi as it’s known in the south East region comes from the word Taqiyah and hence Kufikap is basically Taqiyahcap. 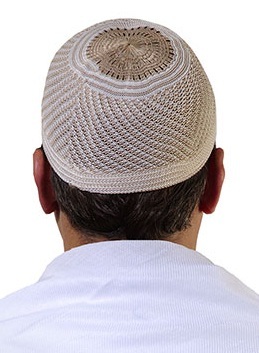 Kufi caps clearly complete an Islamic ensemble for Men’s wear and hence form the perfect gifting option for Ramadan. As it’s the season that calls for mini festivities every night, they fit the bill to be given away as charity to institutions and individuals alike.